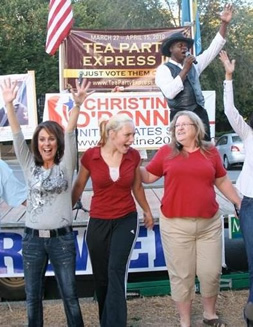 I'm in Delaware with Tea Party Express campaigning for Constitutional Republican Christine O' Donnell for U.S. Senate. In my hotel room, I watched the classic baseball game in which Cal Ripken broke Lou Gehrig's consecutive game streak; 2131 games. After the fifth inning which made the game official, the game was stopped to honor Ripken's achievement. The crowd cheered wildly and endlessly. Even the two TV play by play announcers said they found it difficult to keep their composure. Ripken's achievement transcended baseball. What was the big deal about a guy showing up for work every day and doing his job to the best of his ability? Why were we so moved? Ripken represented something wholesome, good and honorable. Could it be that we recognize how cynical and dishonorable our culture has become? Bad behavior is rewarded. Politicians who we trusted with our vote could not care less about our best interests or desires. Then, along came the tea party movement. Millions of patriots are not only committed to turning our country around from Obama's fast track to socialism, they are determined to see goodness and honor restored in America. Politicians on both sides of the aisle still don't get it. In Delaware, the GOP is backing liberal good old boy, Mike "screw the will of the people" Castle. The People/tea party patriots have rallied around conservative Christine O'Donnell. They are confident, as their U.S. Senator, O'Donnell will keep her promises and show up for work every day to pursue their best interest to the best of her ability; a refreshing old fashion Cal Ripken approach to her job. Millions of patriots are not only committed to turning our country around from Obama's fast track to socialism, they are determined to see goodness and honor restored in America.